Café furniture plays a very important part of in the overall feel of the restaurant and the tables, like the chairs are a huge part in this. It is on these tables that your customers will be dining or drink their coffees so you really want to make sure that the tables not only best represent you, but also set the right image for the café as a whole. Customers are going to be sitting and looking at these tables so make sure that proper maintenance of the tables is taken care of. So once you have planned your area (for help on this visit our Café Furniture Buyer’s Guide), you will now be ready to started looking for the café furniture (for chairs please visit our Café Chairs Buyer’s Guide) below is some information to help you in choosing the right café tables. 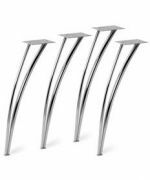 With café tables you normally choose the base and then the tops as most, not all, are sold separately, however some table bases do come complete with table tops. 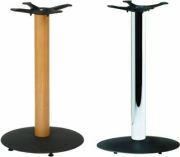 There are really just two types of café table bases, a pedestal base and legged base. 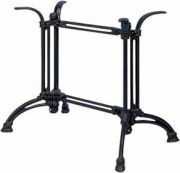 A three or four legged table base is a standard shape and provides adequate support across the whole table. The advantage of this type of base is that they are capable of holding large café table tops; however the disadvantage to these bases is that the legs can get in the way the more people sit around the table. A pedestal base does not have this problem. The leg is in the centre of the table making it easier for more people to sit around. You must be careful when fitting a top to this type of base as there are strict health and safety rules to the size top that can fit on the base and it is best to contact the retailer for advice on these. 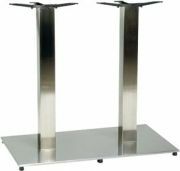 If you have a particularly large table top for example 1200mm x 800mm, there are twin pedestal bases that have two columns side by side to support the tops. 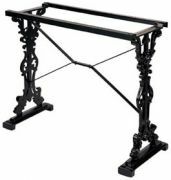 For more café table bases or to purchase any of the bases picture visit our café table top section.